A subset of the Solanum pimpinellifolium collection maintained by AVRDC—The World Vegetable Center, Taiwan was evaluated to assess effects of salt stress on physiological traits and yield-related traits with the aim of identifying potential S. pimpinellifolium accessions useful for salt tolerance breeding in tomato. We undertook a comparative analysis of yield and plant survival traits under normal and salt stress conditions to obtain a first indication of the crucial traits associated with salt tolerance in S. pimpinellifolium. Although most traits of S. pimpinellifolium accessions showed a similar percent decrease in mean under salt stress compared with the cultivated checks, the former exhibited a wide range for all traits, suggesting great genetic diversity that can be exploited for the identification of salt tolerant genotypes. Genetic variability for yield and survival traits under salt stress was quantitative with low to moderate heritability. Results of correlation and path coefficient analysis revealed no correlation between any of the physiological traits with yield-related traits indicating that the ability to survive and yield under salt stress are two independent sets of traits in S. pimpinellifolium. Results of the path analysis along with heritability and genetic advance showed that shoot dry weight and K/Na ratio are the two most critical component traits for survival, while fruit number is critical for yield per plant. The large S. pimpinellifolium panel evaluated in this study revealed five genotypes possessing better survival traits, seven genotypes with good yield traits, and two genotypes combining both superior survival and yield traits under salt stress. The online version of this article (doi: 10.1007/s10681-012-0801-2) contains supplementary material, which is available to authorized users. Salt stress caused by either saline or sodic soils is a major threat to global food production. Approximately 830 million hectares of land worldwide are affected by salt stress and more than half of this problematic land is found in Asia, the Pacific and Australia (Munns 2012). Salinity, sodicity and waterlogging of arable land is reaching serious proportions under irrigated conditions, affecting 20–33 % of all irrigated agricultural land worldwide (Ghassemi et al. 1995; Foolad 2004; Munns 2012). There are many natural and human factors contributing to increased salinity of soils, such as land clearing, the replacement of perennial vegetation with annual crops, low precipitation, high surface evaporation, weathering of native rocks, irrigation with saline water, and poor cultural practices. Increased salinization may affect up to 50 % of arable land by the year 2050 (Wang et al. 2003). Salinity severely impedes plant growth and yield due to interference at the physiological, biochemical (Munns 2002; Munns and James 2003) and molecular level (Mansour 2000; Tester and Davenport 2003). The presence of increased salt in the soil solution leads to osmotic stress, restricting the ability of the plant to take up water and causing water deficit in plant tissues. Soil salinity also disrupts homeostasis and ion distribution in the plant cell, as excessive amounts of salt are absorbed by the roots and channeled in the transpiration stream to the transpiring leaves (Greenway and Munns 1980; Serrano et al. 1999; Zhu 2001). Osmotic stress, ion imbalance and toxicity reduce nutrient uptake and transport capacity, and lead to nutritional imbalances (Ashraf 1994; Parida and Das 2005). Soil is generally considered saline when the electrical conductivity (EC) of the saturation extract in the root zone exceeds 4 dS m−1 at 25 °C with an exchangeable sodium percentage (ESP) of 15 (Foolad 2004). Several strategies have been tested to reduce the negative impact of salt stress on crop yield and a summary for selected vegetables including tomato is given in the recent review paper by Shahbaz et al. (2012). These include the application of chemical amendments, use of drainage techniques to drain salts away from plant roots, exogenous application of plant growth regulators, and grafting of high-yielding cultivars on salt-tolerant rootstocks (Cuartero et al. 2006; Ashraf et al. 2010; Savvas et al. 2010). The latter seems to be a promising strategy as yield increases of up to 80 % have been obtained by grafting cv. ‘Jaguar’ on to salt-tolerant tomato cultivars (Shahbaz et al. 2012). This positive effect of rootstocks on yield of grafted cultivars appears to be related to the capacity of the grafted plants to maintain ionic homeostasis in leaves by avoiding a steep increase in the accumulation of toxic ions and maintaining the acquisition of essential nutrients like K+ (Albacete et al. 2009). However, many of the tested practices are not compatible with sustainable horticulture or are costly and highly labor-intensive. Another promising and effective way of overcoming salinity problems is the use of salt-tolerant varieties or, if not available, the incorporation of salt-tolerant traits from crop wild relatives into commercial cultivars. Therefore, a thorough understanding of salt-tolerant traits that are relevant to crop adaptation, precise and reliable screening methods, the availability of genotypes with adaptive traits, knowledge of genes that regulate the adaptive mechanisms and effective strategies to introgress adaptive traits from crop wild relatives into commercial cultivars are important for tomato breeders to develop salt-tolerant cultivars. Cultivated tomato is moderately sensitive to salinity. It tolerates soils with an EC of the saturation extract (EC) of up to 2.5 dS m−1. Above this threshold value the crop suffers a 10 % yield decrease for each unit increase of salinity (Maas et al. 1977; Maas 1986). In contrast, Ayers (1977) reported reductions of tomato yield of 10, 25 and 50 % when irrigation water with an EC of 2.3, 3.4, and 5.0 dS m−1, respectively, was applied. Only the lowest EC level of 1.7 dS m−1 had no effect on yield. Similarly, drip irrigation water with increasing EC levels of up to 4 dS m−1 led to a linear reduction in the number of fruits, average fruit weight and total yield, while the yield of marketable fruits was affected in a quadratic manner (Scholberg and Locascio 1999). The responses of plants to salinity vary according to the developmental stage (Dumbroff and Cooper 1974; Munns 2002). Young seedlings of rice (Lutts et al. 1995) and tomato (Foolad 2004) are generally more sensitive to salt stress than adult plants. During flowering and fruit setting, tomato plants are able to withstand NaCl concentrations sufficient to kill them in the seedling stage (Elshourbagy and Ahmed 1975). Salt stress during tomato germination delays the onset and reduces the rate of germination, resulting in variability of crop maturation and reduced yield. Salt tolerance during this initial growth stage is genetically controlled with a heritability estimate of 0.73 and can thus be improved by phenotypic selection (Foolad and Jones 1991; Foolad and Lin 1997; Foolad 2004). Salt tolerance during vegetative growth stages of tomato also is controlled genetically, but is more complex than salt tolerance during germination (Foolad 1996, 1997). However, salt tolerance during seed germination appears to be independent of that during vegetative growth stages controlled by different quantitative trait loci (QTLs) (Foolad 1999a, b; Foolad and Lin 1997). Marker-assisted selection and breeding could prove useful for simultaneous improvement of salt tolerance at both developmental stages. Salt stress adversely affects chlorophyll fluorescence and the growth of stem, leaves, and roots, and subsequently, yield and fruit quality in tomato (Cuartero and Fernandez-Munoz 1999; Cuartero et al. 2006; Hajer et al. 2006). While genetic variability for salt tolerance traits is limited in cultivated tomato, sources of tolerance have been reported between and within wild Solanum species: S. pimpinellifolium, S. peruvianum, S. cheesmaniae, S. habrochaites, S. chmielewskii and S. pennellii (Lyon 1941; Tal 1971; Rush and Epstein 1981; Dehan and Tal 1978; Phills et al. 1979; Tal and Shannon 1983; Jones 1986; Shannon et al. 1987; Foolad and Lin 1997). Introgression of salt tolerance traits from distant wild relatives to cultivated S. lycopersicum is difficult due to crossability barriers and linkage drag. Finding sources of salt tolerance in S. pimpinellifolium will be helpful as it is the closest wild relative and readily crossable with S. lycopersicum. S. pimpinellifolium also has been a source of useful genes for many other important horticultural traits of cultivated tomato including yield and disease resistance (Foolad 2004). It has been suggested that S. pimpinellifolium accessions could be the most promising sources for improvement of salt tolerance in tomato cultivars (Bolarín et al. 1991; Cuartero et al. 1992). This species is native to Peru and Ecuador in Western South America, where it is found in dense populations located in undisturbed areas and adapted to diverse environmental conditions ranging from the coastal desert climate to humid and foggy conditions of higher altitudes (Wiersema and León 1999; Zuriaga et al. 2009; USDA-ARS 2011). Considering that the natural range of S. pimpinellifolium encompasses environments as diverse as the Ecuadorian tropical forest and the coastal Peruvian desert, this species is a potential source of beneficial alleles for abiotic stress tolerance. In the present study a subset of the S. pimpinellifolium collection maintained by AVRDC—The World Vegetable Center in Taiwan was evaluated to assess the effect of salt stress on physiological traits and yield-related traits with the aim to identify potential S. pimpinellifolium accessions that may be useful for salt tolerance breeding in tomato. AVRDC maintains a S. pimpinellifolium collection of 322 accessions (AVGRIS 2012). From this collection, a subset of 94 accessions was chosen for the study based on the passport data, genetic structure and a fair representation of the core set developed by Rao et al. (2011). The passport details of the genotypes employed for this study are presented in Supplementary Table 1. Two S. lycopersicum genotypes—the Indian cultivar ‘Arka Meghali’ and the AVRDC inbred line CA4, which are popular genotypes both as commercial varieties and also as breeding material in South and South East Asian tomato improvement programmes, were included as checks. The trials were conducted from January to May 2010 in the net houses of AVRDC headquarters, Taiwan in a split-plot design with two treatments: salt stress (200 mM NaCl solution) and control (standard irrigation water). Three replications were used per treatment with three plants (one plant in each pot) per replication. All 94 S. pimpinellifolium accessions along with the checks ‘Arka Meghali’ and CA4 were raised in seedling trays filled with peat moss and watered daily. Five-week-old plants were transplanted into 20 L plastic pots filled with a sterilized mixture of peat, decomposed organic residues and soil in the ratio of 1:1:1. The type of soil used was a sandstone-shale alluvial soil with lime concretions, well or moderately well drained, with a silt loam to silty clay loam texture, alkaline pH of 7.2–8.1 and low content in organic matter and low cation-exchange capacity. A progressive salinization technique was employed for imposition of salt stress. All pots in the salt treatment were irrigated with 500 mL of 200 mM NaCl solution every alternate day. This treatment level was standardized based on earlier studies that helped in clear distinction between salt tolerance and susceptibility, both in terms of survival and also yield-related traits. No fertilizer was applied in this experiment to avoid interference with the salt treatment. Stress imposition started from the ninth week of sowing, when most of the genotypes started flowering. The duration of the stress treatment was almost 3 months (11 weeks). Soil EC was measured at the end of the experiment by the saturated paste method (Slavich and Petterson 1993) in both salt treatment and control. The average EC of the substrate in the salt treatment was approx. 40 (±3) dS m−1, while the substrate of the control measured 1 (±0.2) dS m−1. During the course of stress imposition various physiological traits as well as yield and yield components were recorded under both treatments. Leaf chlorophyll content was measured at each fourth expanded leaf from the plant top at 15 weeks after sowing using a portable Minolta Chlorophyll Meter SPAD 500. SPAD readings reflect the greenness of the leaves and are an indirect measurement of chlorophyll content. As reference, chlorophyll content was determined destructively on 100 leaf sections of 2 cm2 with acetone according to Bruinsma (1963). The absorbance of extracts was evaluated at 663.6 nm (A663.6) and 646.6 nm (A646.6) with an ultraviolet–visible (UV–vis) spectrophotometer (Perkin-Elmer, Lambda 5, Massachusetts, USA) according to the equations of Porra et al. (1989). A linear function between chlorophyll content and SPAD values was established and used to calculate leaf chlorophyll content. Leaf sodium and potassium concentrations were measured at each fourth expanded leaf from the plant top at 15 weeks from sowing using Cardy sodium and potassium ion meters (HORIBA, Model C-122 and C-131, Japan). The selected leaf was crushed and homogenized in a sterilized polycover using a metal ball roller. One hundred μL of homogenized sap was used for estimating the sodium and potassium concentrations. However, preliminary observations revealed negligible concentrations of sodium with minor differences among genotypes under control conditions. Hence, sodium and potassium ion concentrations under control treatment were not recorded further. K/Na ratio was calculated by dividing leaf potassium by the leaf sodium concentration at 15 weeks from sowing. Plant height (cm) was recorded from the base of the plant to the tip of the meristem at the end of the experiment. Shoot dry weight (g) including all above ground parts except fruits was recorded at the end of the experiment. Dry weights were determined after drying at 80 °C in an oven until a consistent weight was recorded. Survival score of the plants was obtained based on a 0–4 scale (0 for dead, 1 for >75 % leaf area damage, 2 for 51–75 % leaf area damage, 3 for 25–50 % leaf area damage and 4 for <25 % leaf area damage) at the end of the experiment. Percent fruit set was obtained by dividing the total number of fruits by the total number of flowers set on 3–7th trusses, multiplied by 100. Number of fruits per plant was obtained from four harvests. Average fruit weight (g) was obtained by dividing total fruit fresh weight by the total number of fruits collected from a single plant. Yield per plant (g) was obtained by measuring total fruit weight. The mean data of the above traits were used to calculate phenotypic co-variance (PCV), genotypic co-variance (GCV), broad-sense heritability (H) and percent genetic advance over mean. The performance of 96 genotypes for the above traits, except leaf sodium and potassium concentrations (due to negligible concentrations in the control) and survival score under salt stress was compared with their performance under control conditions to obtain percent change in performance due to salt stress. The percent change in mean was used for determining the correlation among the various traits. Broad sense heritability was estimated based on between and within accession variances and path co-efficient analysis served to partition the total correlation into direct and indirect effects to get a clear picture of character associations. Path analysis was carried out both with yield and also survival score as the dependent variables. The statistical analysis was carried out using GENRES statistical program (GENRES 1994). Mean, range and critical difference (CD) values as well as percent reduction in mean due to salt stress of various physiological and yield-related traits of S. pimpinellifolium accessions compared with S. lycopersicum checks ‘Arka Meghali’ and CA4 are presented in Table 1. For further reference, trait means of all genotypes and treatments including ANOVA, estimates of CD and minimum and maximum values are presented in Supplementary Table 2. Overall, substantial reduction in chlorophyll content, plant height, shoot dry weight, fruit set percentage, fruit number, yield per plant and average fruit fresh weight was observed under salt stress compared with control conditions. While similar trends were observed in the S. pimpinellifolium accessions and the S. lycopersicum checks for most traits, shoot dry weight and mean fruit weight of the former showed less impact under salt stress compared with the cultivated checks. Also, mean survival score of S. pimpinellifolium accessions under salt stress was much higher (score of 1.8) compared with ‘Arka Meghali’ (score of 0.3; almost all plants dead) and CA4 (score of 0.9; severe plant damage). There was a remarkable increase and a wide range in leaf sodium of S. pimpinellifolium accessions under salt stress. Similar mean sodium levels under salt stress were measured with the two cultivar checks. The concentrations were negligible under control conditions with a mean leaf sodium content of S. pimpinellifolium accessions, ‘Arka Meghali’ and CA4 of 136, 82, and 112 ppm, respectively (data not presented in table). Heritability estimates under salt stress generally were lower than under control conditions (Table 2). The estimates under salt stress ranged from low (0.19 for leaf K content) to moderate (0.66 for leaf Na content) as expected for polygenic traits. Apart from leaf Na content, moderate heritability was recorded for the K/Na ratio (0.47) and survival score (0.41) among physiological traits and for fruit set (0.42), fruit number (0.55), fruit weight (0.55) and yield per plant (0.41) among yield-related traits. Chlorophyll content and plant height showed low heritability whereas K content and shoot dry weight presented the lowest heritability. From the correlation analysis (Table 3), it is evident that the physiological traits (chlorophyll content, leaf sodium content, leaf potassium content, K/Na ratio, plant height, shoot dry weight and survival score) were all correlated among each other, except for Na content which was not correlated with chlorophyll content, plant height and shoot dry weight; and plant height was correlated only with chlorophyll content. Similarly, yield-related traits (percent fruit set, fruit number and yield per plant) were correlated among themselves. However, mean fruit weight did not correlate with other yield traits. Physiological traits were not correlated with yield or yield-related traits. The direct and indirect effects of various physiological traits and yield-related traits on yield per plant under saline conditions are shown in Table 4. The results further support those of the correlation analysis. None of the physiological traits were associated with yield per plant. Only fruit number had a very high significant direct effect (0.841) on yield. Percent fruit set had a significant negative indirect effect (−0.311) over yield per plant via fruit number. This surprising observation may be related with the fact that fruit set was estimated over the 3rd to 7th nodes while fruit number was determined on the entire plant. It is likely that salt-susceptible accessions produced fruits on the first few trusses and later died under salt stress and this may have led to the negative indirect effect of percent fruit set observed between the third and seventh node on yield via the total number of fruits per plant. The results of the path coefficient analysis of various yield-related and physiological traits on plant survival under saline conditions are presented in Table 5. None of the yield traits were associated with survival. Among the various physiological traits, shoot dry weight had the highest significant direct effect (0.672) followed by K/Na ratio (0.218) on survival. Physiological traits—chlorophyll content (0.232), K/Na ratio (0.332) and plant height (0.317)—had positive significant indirect effects on survival via shoot dry weight. The results show that shoot dry weight and K/Na ratio are the two most critical component traits for survival, while fruit number is critical for yield per plant. These traits had moderate heritability and also recorded higher genetic advance under salt stress compared with control conditions (Table 2). Five S. pimpinellifolium accessions (26, 42, 46, 72, 75) deserve to be highlighted for high survival scores and high shoot dry weight. Two (46, 72) also showed a high K/Na ratio (Table 6). Moreover, plant height and fruit set of accession #26 (VI007002) was clearly above the mean of all 94 accessions evaluated under salt stress with only a slight depression compared with control conditions. Seven accessions (8, 10, 25, 55, 57, 65, 86) showed relatively high fruit number and yield per plant under salt stress, clearly exceeding the mean of the 94 accessions evaluated. All of these lines had a much higher than mean fruit number under control conditions and only three accessions (10, 65, 86) showed relatively less depression under salt stress than the other lines. Also, fruit set of these lines clearly was above the mean of other lines. Fruit set was unaffected by salt stress in two lines (10, 86) and showed little depression in two more lines (8, 65). Shoot dry weight of three lines (8, 55, 65) was less affected by salt stress and was clearly above the mean of all lines. In addition, accession #55 presented a relatively high K/Na ratio. Two genotypes (24, 54) showed a combination of high survival score and high fruit number under salt stress. Breeding for salinity tolerance is a complex task due to the high number of traits involved, their quantitative nature, low or moderate heritability, epistatic gene action, and high degree of environmental sensitivity. A further complication is the observation that salt tolerance mechanisms differ between stages of plant development, as stress tolerance during germination of tomato appears to be independent of stress tolerance during vegetative growth stages (Foolad and Lin 1997; Foolad 1999a, b). Owing to this complexity, genetic variation for salt tolerance in wild germplasm still remains largely unexploited. Salt tolerance traits have been introgressed successfully into commercial tomato varieties from the wild tomato species S. cheesmaniae and S. pennellii through backcrossing or recurrent selection methods (Shannon 1997). Although S. pimpinellifolium is the closest relative of cultivated tomato and several accessions already have been identified and characterized for salt tolerance (Bolarín et al. 1991; Cuartero et al. 1992; Hassan et al. 1990; Villalta et al. 2008) the use of this species in breeding programs for salt tolerance is still largely untapped. Salt tolerance of crops is often expressed as relative yield depression for a defined level of soluble salts in the soil solution compared with yields under nonsaline conditions (Bernstein et al. 1974). It has been suggested that commercial crop yield should be the ultimate agronomical criterion for establishing salt tolerance of lines (Maas et al. 1977). However, as salinity affects a wide range of physiological, biochemical and molecular functions and processes in plant growth and development, the enhancement of crop salt tolerance requires a combination of several physiological traits, not simply those directly influencing yield (Cuartero et al. 2006). This has been confirmed in recent experiments with cultivated tomato in which a steady increase in salt concentration led to a decrease in total chlorophyll content, plant height, and number of fruits (Babu et al. 2011). Moreover, fruit yield is certainly not the only valid criterion for salt tolerance in crop wild relatives that have not been selected or bred for high yield. Therefore, Bolarín et al. (1991) used leaf and stem dry weights as traits of vegetative yield in screening wild tomato species for salinity tolerance. The first step in using such physiological traits in breeding programs is to prove the existence of sufficient genetic variability and moderate to high heritability. We undertook a comparative analysis (percent change in performance) of yield and plant survival traits under normal and salt stress conditions to obtain a first indication of the crucial traits associated with salt tolerance in S. pimpinellifolium. Although most observed traits of S. pimpinellifolium accessions showed a similar percent decrease in mean under salt stress compared with the cultivated checks, the former exhibited a wide range for all traits, suggesting there is great genetic diversity that can be exploited for the identification of salt-tolerant genotypes. Two traits—shoot dry weight and average fruit weight of S. pimpinellifolium accessions—were less affected under salt stress compared with S. lycopersicum. Less impact on shoot dry matter under salt stress in salt-tolerant lines also was observed in pepper (Aktas et al. 2006). Hence, dry weight of vegetative plant yield appears to be a valid criterion for salt tolerance in crop wild relatives of tomato as suggested by Bolarín et al. (1991). A relatively small reduction in total fruit number due to salt stress was seen in the cultivated checks, especially CA4, compared to S. pimpinellifolium. CA4 and ‘Arka Meghali’ generally produce small numbers of large fruits compared to S. pimpinellifolium accessions which normally bear large numbers of small fruits. The large reduction in total fruit weight under salt stress clearly indicates the effects of salt stress on yield in the cultivated checks. In addition, the performance of cultivated checks might have been affected by the ‘no-input’ (fertilizer) conditions of the experiment. It must also be noted that CA4 is sensitive to heat stress which could cause a reduction in total fruit number even under control conditions (De la Peña et al. 2011). While all physiological traits (chlorophyll content, leaf sodium and potassium content, K/Na ratio, plant height, shoot dry weight and survival score) and most yield-related traits (percent fruit set, fruit number, and yield per plant) were correlated among each other as shown by correlation and path coefficient analysis in our studies, there was no correlation between any of the physiological traits with yield-related traits, indicating that the ability to survive under salt stress and the ability to yield under salt stress are two independent sets of traits in S. pimpinellifolium. Mean fruit weight was the only trait that did not correlate with other yield traits, perhaps due to the much lower effect of salt stress on fruit size of this small-fruited species as compared with the cultivated species. 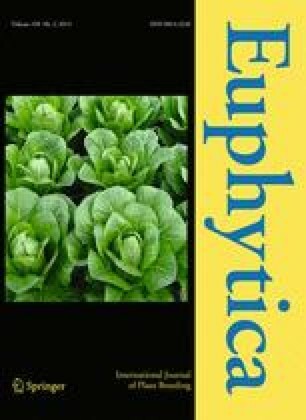 Based on QTL analysis of physiological and yield traits of two segregating populations derived from a salt-sensitive S. lycopersicum var. cerasiforme genotype and one salt-tolerant male line each of S. pimpinellifolium and S. cheesmaniae, Villalta et al. (2008) observed that fruit yield was not strongly associated with any physiological or vegetative trait under salinity. Only two sodium QTLs could be mapped in genomic regions of chromosome C1 and C8 where fruit yield QTLs were also located, but in both cases the beneficial allele corresponded to the salt-sensitive, cultivated S. lycopersicum var. cerasiforme species. The authors suggest that adaptation to salinity of these wild relatives of tomato during evolution is related to plant survival. Therefore, selecting for physiological traits per se or yield traits per se may not result in improved performance under salt-stress conditions, and breeders may have to consider simultaneous selection for both traits (Saranga et al. 1992). The path coefficient analysis further indicated that fruit number has a high direct effect on yield (0.841), while shoot dry weight (0.672) is critical for survival under saline conditions, followed by the K/Na ratio (0.218). Chlorophyll content, K/Na ratio and plant height had an indirect positive effect on survival via shoot dry weight. Among the physiological traits, the heritability estimates for leaf sodium content (0.66), K/Na ratio (0.47) and survival score (0.41) were moderate and low for chlorophyll content (0.34), plant height (0.32), shoot dry weight (0.23) and K content (0.19). These observations are in line with Cuartero et al. (2006) who also reported moderate to low heritability for K/Na ratio, leaf sodium content, leaf potassium content and shoot dry weight. Similar heritability estimates in the range of 0.3–0.45 for total fruit yield, total dry matter and total dry matter under salinity relative to the control were reported by Saranga et al. (1992) who studied backcross populations derived from a cross between S. lycopersicum (M82-1-8) and the wild species S. pennellii (LA-716) for salt tolerance. The authors suggested that salt tolerance of tomato could be improved by selection based on dry matter and yield traits under salinity. Genetic advance estimates ranged from low (15.36) for chlorophyll content to high for the yield-related traits, fruit number (145.69 %) and fruit weight (145.23 %). Among physiological traits, leaf Na content (47.53 %), K/Na ratio (52.88 %), shoot dry weight (54.94 %) and survival score (61.82 %) showed higher genetic advance. Traits with high heritability coupled with high genetic advance are the most desirable for selection in breeding programs. Interestingly, traits with moderate heritability—leaf Na content, K/Na ratio, survival score, fruit set, fruit number, fruit weight and total yield per plant also showed higher genetic advance, suggesting that additive genetic variation exists for those traits, and may be important for selection in breeding programs. Plant height and chlorophyll content showed low heritability with very low genetic advance, whereas leaf K content showed the lowest heritability with lowest genetic advance suggesting that selection for salt tolerance based on these traits alone may not be effective. Shoot dry weight showed low heritability but higher genetic advance suggesting the possibility of non-additive genetic control of this trait. There is evidence that the genetic basis of salt tolerance in crop plants is complex involving heterotic, dominant, semi-dominant, additive, non-additive, and epistatic effects (Flowers 2004; Li et al. 2011). Monforte et al. (1997) reported that salt tolerance in S. pimpinellifolium accessions (L1 and L5) is characterized by higher fruit number, total fruit weight and mean fruit weight under saline condition, which is controlled by several QTLs with epistatic and heterotic effects. In contrast, Sun et al. (2010) reported that salt tolerance in a S. pimpinellifolium accession (PI365967) is characterized by higher survival rate, lower growth inhibition at the vegetative stage and less accumulation of sodium in shoots with the activation of salicylic acid pathway related genes. The large S. pimpinellifolium panel evaluated in this study revealed five accessions with a high survival score under salt stress, characterized by a relatively high shoot dry weight (Table 6). While the leaf sodium content of all five lines was clearly below the mean of other lines, especially in the case of line 46 (VI008107; PI279373), only three lines presented a high K/Na ratio. Apart from a high survival score and high shoot dry weight, line 26 (VI007002; PI212409) showed only a modest decrease of plant height and fruit set under salt stress. Another set of seven accessions presented high fruit number and yield per plant (Table 6) with only modest survival score under salt stress. Out of the seven accessions, only one presented a high K/Na ratio (line 55), while three lines presented a relatively high shoot dry weight. Six of the seven lines presented a relatively high fruit set. There were two lines (VI006995 and VI009110, also known as LA1357) that combined high survival score with high fruit number and might therefore be good candidates for introgression of salt tolerance traits into cultivated tomato. Our results did not confirm earlier reports (Hassan et al. 1990) of salt tolerance of line LA1579 (line 94; VI057411). This line presented higher leaf sodium content, and lower K/Na ratio, survival score, shoot dry weight, and fruit number compared with the lines discussed above. Our results suggest that breeders may rely on simultaneous selection for fruit number, shoot dry weight and K/Na ratio for improvement of both survival and yield under saline conditions. However, the residual effects for survival (0.51) and yield (0.49) were high, suggesting that there are other traits influencing these parameters apart from those included in this study. Conventional breeding methods may be inefficient to combine adaptive traits with yield and quality traits of elite varieties successfully. The combination of conventional and molecular breeding techniques, including marker-assisted transfer of QTLs associated with salt tolerance traits, may be more effective (Foolad and Jones 1993; Wang et al. 2003; Cuartero et al. 2006). In the present study of salt tolerance in Solanum pimpinellifolium, physiological traits were not correlated with yield or yield-related traits, and the latter were not linked with plant survival. The results of the path analysis showed that shoot dry weight and K/Na ratio are the two most critical component traits for survival, while fruit number is critical for yield per plant. These traits had moderate heritability and also recorded higher genetic advance under salt stress compared with control conditions. Based on the traits that were found to be critical through path coefficient analysis for plant survival, five genotypes have been identified that recorded high shoot dry weight, K/Na ratio (three genotypes) and survival score. These can be used as a source for physiological traits leading to survival under salt stress. Seven genotypes were identified presenting relatively high fruit number and yield per plant under salt stress, clearly exceeding the mean of the majority of accessions. Fruit set and/or number of fruits per plant of all seven lines were clearly above average. These accessions can be a source for salt tolerance in terms of yield. Two genotypes showed a combination of high survival score and high fruit number under salt stress. The accessions identified in this study tolerant to an EC level as high as 40 dS m−1 have not been reported earlier, except VI037290, also known as LA1606, and can be an excellent source for basic studies on salt tolerance as well as potential candidates for salt tolerance breeding in tomato. Efforts are underway to use this screening information for allele mining of candidate genes/loci through association mapping. We thank Dr. Chin-hua Ma, Soil Scientist, AVRDC—The World Vegetable Center, for valuable advice concerning the soil EC determinations.